These are one of my absolute favorite cookies of all time! They are soft and delicious and are perfect for those browning bananas! \My grandma’s cookbook really does have some of THE BEST recipes in it. She gives each grandchild two of her cookbooks when they graduate high school to help them get started on their own. One of these cookbooks is dedicated purely to desserts, the other is for everything else! 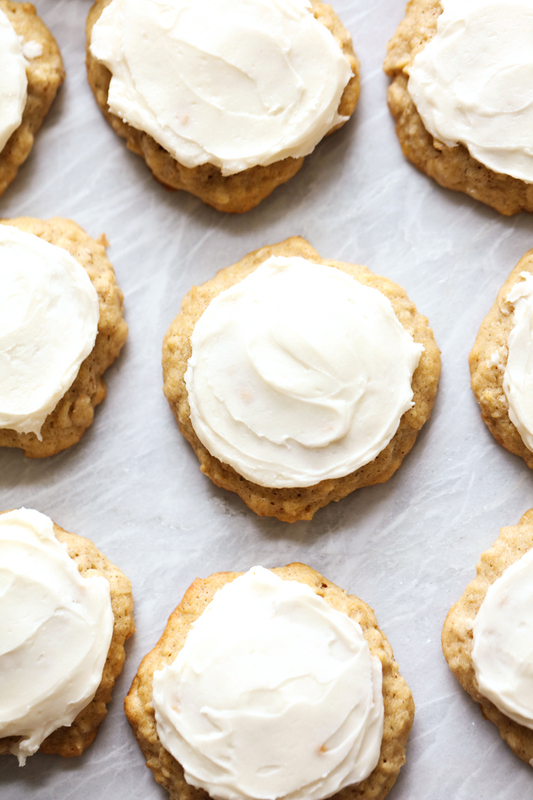 I remember as a little girl, my grandma and I would always make these cookies together regularly…probably because she knew how much I loved them! It is also an awesome way to use up brown bananas! I changed her recipe up just a bit to replace the shortening with butter and because of that changed a few of the steps around. I promise these will be a huge hit! They are so soft and taste like banana bread in cookie form! This is a must try! 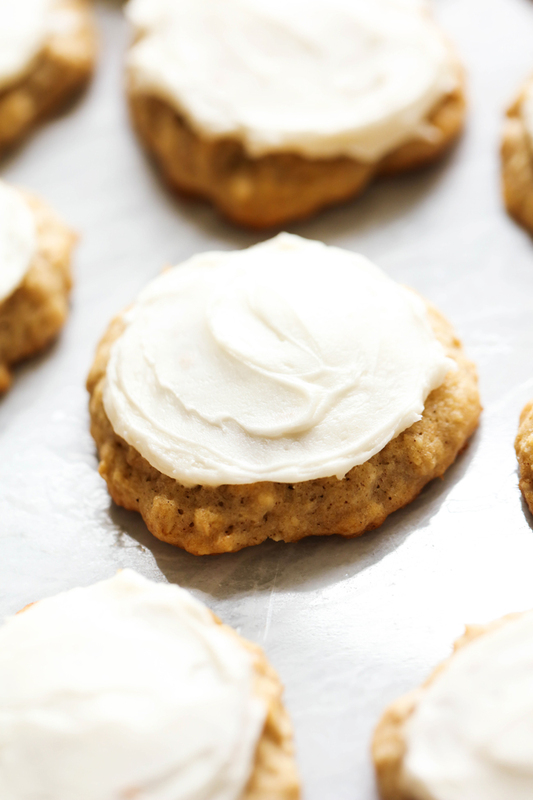 Delicious cookies that taste like banana bread! In a large bowl, cream butter and sugar together until smooth and creamy. Add mashed bananas and beat until well incorporated. Sift dry ingredients together and to batter and beat until well incorporated. Spoon drops onto cookie sheet and bake at 400 degrees F for 8-10 minutes. Let cool on cooling rack before frosting. Cream butter. Add remaining ingredients and beat until smooth. You can add more milk or powdered sugar to get it to the consistency you want it. 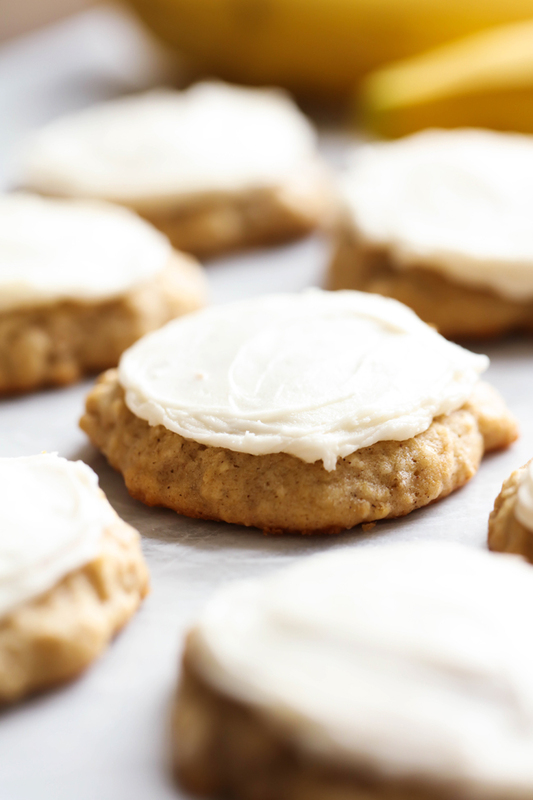 Frost banana cookies and enjoy! Note: this is a lot softer than normal cookie dough and will not form balls, hence spoon "drops"
Vivian, but you can call me Viv. banana cookies? never heard of this... but WOW, glad I have now! Banana cookies sound yummy!! Great idea!! hiya nikki!thanks so much for stopping by my blog. i am now your newest follower - looking forward to catching up on your recipes.hope you have a great weekend.cheryl xox. What a lovely gift from your Grandma! 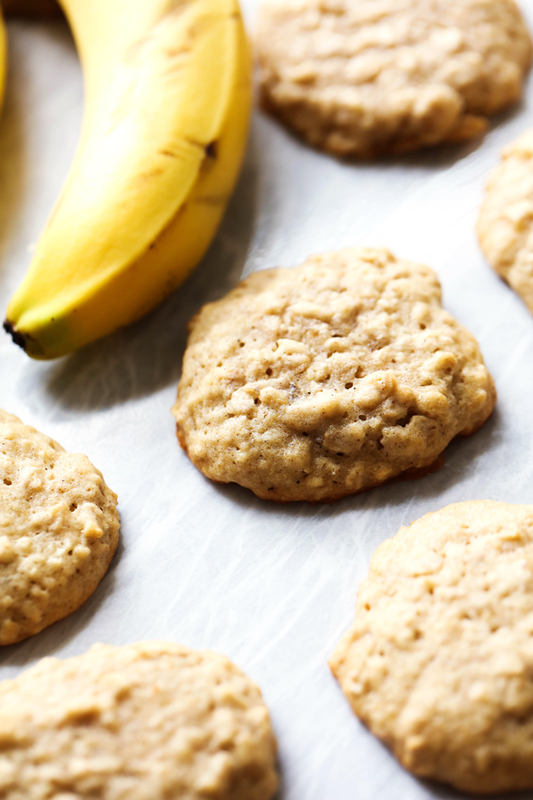 Family recipes really are the best, and your banana cookies look amazing! I love banana nut bread, wonder if these are just as good...guess I'll make them and see!Thanks! Thanks for posting on Church Supper. Now I know what to do with my rotten bananas instead of the same old banana bread! Just wanted to drop by and say that my son and i made these cookies this weekend, after i started following your blog, and they are fantastic! We're in London so had to convert the measurements to metric, but all turned out ok! Your Grandma's recipe has gone transatlantic, and into my recipe book!! I made these for my children for an after school snack and they declared these cookies to be their new favorite! They seriously are the best! Yum! ...They freeze great too. These look great! I'm just wondering what can be substituted for the shortening? Thanks! 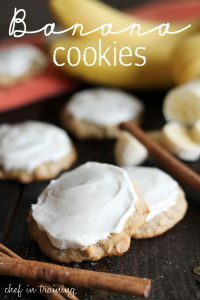 I came across this recipe on Pinterest a few days ago when looking for a banana cookie that used real bananas instead of banana flavored pudding. I made a modified version of these tonight, and they were awesome! (I used 1/3c applesauce instead of shortening, added a tbsp of corn starch to thicken them a little and keep them fresh for longer, added walnuts, and added a few chocolate chips to a few of them. Such a great alternative to banana bread! I'm going to make them next week with pumpkin instead of bananas. I just finished making these...DELICIOUS! They are fluffy and moist, and the frosting on top...wow! Can you freeze the frosting? If not, anyone know how long it will keep in the fridge? Mmmmm! We just made these and ate them for our peaceful Sunday afternoon. Thanks for the fun and the yum! Wondering if anyone knows.....can the shortening be substituted with coconut oil? Found your blog via Pinterest! I just made these today and we all loved them! I also substituted applesauce for the shortening...trying to be somewhat healthy ;) Can't wait to try out some of your other recipes! Thanks for sharing. Made these today and they are great! I am not a fan of frosting so I skipped it and they are still delicious. Great idea, I wondered about that! The texture was OK? I found ur blog through pinterest and am loving it! Ive tried several recipes so far which have all been super easy and delicious! And I've got several more on my must try list. Thanks for all the great recipes! Thank you for..just thank you. These are absolutely hands down the best cookies ever. what kind of book did your grandma gave u? care to share? I will try this. I freeze my bananas till I need them. Good idea to add nutella! YUMMM...here's my modified version: http://mejiamamma.blogspot.com/2012/09/banana-oatmeal-cookies.html# - soooo good!! hi , would you tell me how does the frosting make? Is it cooked or just blended ? Just found this recipe on Pintrest and it sounded so good I had to try it! It is delicious! Haven't decided if I am going to frost them or not, tasted great without frosting. I did use the applesauce instead of the shortening so you do need to lightly grease the cookie sheet. Great recipe! Victoria, did the applesauce work? The recipe calls for milk, now we use 0% skim milk will that make difference in this recipe and others? YUM! Perfect timing too....I have bananas I need to use. Can you substitute the shortening with something else? Nikki, I'm at a loss as what to use for "shortening"? I would normally use crisco, but anything else I could sub here? My grandmother always made these for us kids and these are still being made in our family today by most of us kids. The only other ingredient that grandma added was 2 cups of chocolate chips. I have the Chiquita Banana Recipe Book that was my moms printed in 1950 which has the recipe. These look absolutely delicious and I am defineately going to have to make these for my 14 yr old daughter. She loves anything banana and has been asking me for the past couple of days for a banana cream pie but think I'll surprise her tomorrow after school with these. Thanks for always inspiring me to cook/bake for my family or else we'd be eating out all the time lol! Thanks again! These cookies are"to die for". My husband likes without the icing but I loved with the icing. Thank you, as this is a recipe I will keep and use..
By "shortening" arebyou talking about butter or cisco? also how big are your spoon drops?? our cookies are not flat. Is it possible to substitute shortening? Hi, well, I just made these for the very first time because I didn't want to toss my bananas.... This are delicious cookies!!! But I have a question, I just made them for my hubby and he wont eat them all in one night, how long do they last? Should they go in the fridge, cause of the buttermilk frosting? Hi! I live in Norway and I've tried several of your recipes before. However we don't use shortening much. Is it in liquid form in this recipe? I've found something to use, but it is solid, like margarine/butter. Thank you for your great recipes! you can just sub it out with butter. I have tried it that way and it is just as good! :) Hope that helps! There is no nutrition information on the banana cookie recipe. Enjoy - oh yes - these are delish!! Can't wait to try these, however, in the ingredients you state one egg and in the instructions you state plural eggs. Is it only one egg? Also do you bake these on a cookie sheet that is greased or not greased? Thanks so much. Can't wait to try these. Under the ingredients you say one egg however under the instructions you say eggs. Is it one or more eggs? Also do you use a greased or ungreased cookie sheet? Thank you. Can't wait to try these. What can I substitute for the shortening? Oil? And how much? I have successfully substituted butter several times :) cup for cup. Haven't tried oil. if I don't have any shortening can I substitute butter? The cookies were delicious. I did however, use butter in place of the shortening & only put a small amout of the frosting on the cookie. Wrapped in air tight container, cookies stay soft for quite some time. Not happy with thise recipe at all. I love to bake and this recipe did not turn out at all. Did not end up looking like the picture. The cookies did not flatten out and turned out like little pucks. Temp was to high and time was to long because they ended up burning. Waste of ingredients and time. I would not recommend trying this recipe. I am definit;ly going to dry these banana cookies. They look yummy and have easy recipe.Thank you for sharing!! These were a hit. My kids loved them and so did my co-workers. Made these cookies today and they do indeed taste like banana bread....soft and delicious. The frosting is a nice addition and makes them a bit nicer to serve as a dessert, but not necessary. The bare cookies are such a treat with a cold glass of milk!!! I was googling a recipe for my overripe bananas and I came across a lot. I decided to make this one (without the frosting) and oh my goodness!!! They are delicious!!! And so easy, too! :-D This is definitely a keeper! Thank you SO much for sharing!